Youth Academy gives children a fun and informative summer activity. Most kids on summer break spend time at the pool, hang out with friends and play sports. However, in Burlington Township, a large number of kids participated in the 2nd Annual Youth Police, Fire and EMS Academy on July 14. Fifty-six kids between the ages of 9 and 14 participated in the academy, which is led each night by a different part of the community’s departments. The opening night of the academy saw the students learn about fingerprinting, gun safety and drug awareness and see a K-9 demo. Officer Floyd Hazzard, who is a vocal leader in the youth academy, praised the work the departments do with the children. The second night saw the students travel to the Burlington County Fire Academy in Westampton for a visit with the Burlington Township Fire Department. 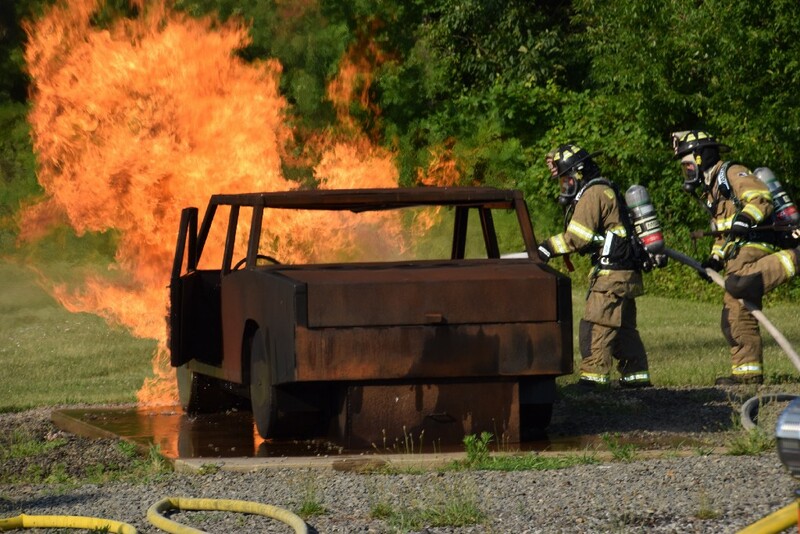 Students began their evening by watching firefighters put out a fire on the academy’s practice ground. Following the demonstration, students were taught about fire extinguishers and turnout gear worn by firefighters and took a tour inside fire trucks. Fire Marshal Matthew Tomaszewski, who is also a key part in running the academy, praised the chance to teach young children about fire safety. “It’s great to inform the kids about these services in our town, and to hear feedback following the academy,” Tomaszewski said. As the academy rolled on, the EMS took leadership on the third evening, showing students how to bandage an injured patient and how to respond to an endeavor emergency, while also providing a CPR demo. Chief Dave Ekelberg, who runs the EMS section, feels the academy has grown and will continue to grow in the coming years. “It’s a top-notch program. We are able to teach the kids about three main departments in our township, which is very important,” Ekelberg said. Following a night of practice, the 56 students were honored in their graduation on July 14 at the Burlington Township High School Performing Arts Center. The students also enjoyed pizza and cake following the ceremony, which concluded the informative and fun week. Now it’s time for the leaders of each department to obtain feedback on the academy, which looks to grow to neighboring communities. For more information about the Youth Academy, contact Hazzard at (609) 386–2019 or fhazzard@burltwppd.com.